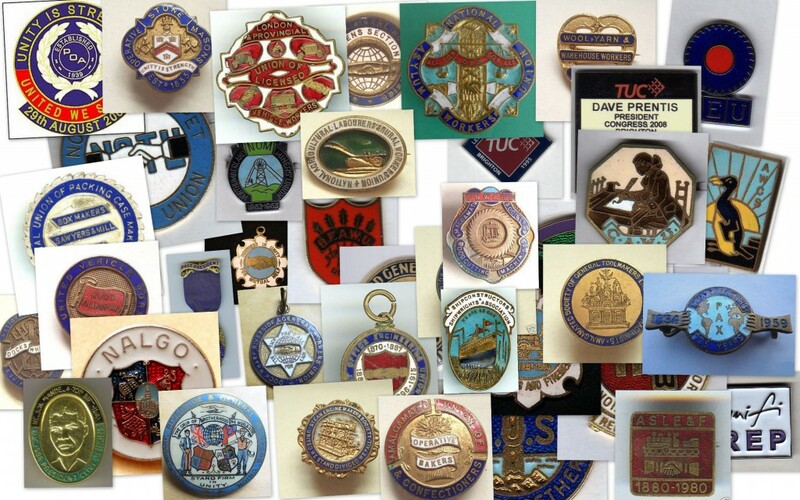 About Trade Union Ancestors and its sources – how this site can help you, and what it can’t do. Trade Union Ancestors aims to help family historians research their ancestors’ involvement in the British trade union movement of the nineteenth and twentieth centuries. The site is run as a hobby – in my own time, at my own expense and largely for my own entertainment. It is, as you can see, far from complete. I also operate Chartist Ancestors, which as its name suggests aims to help family historians with an interest in the mid-nineteenth century struggle for democracy. First, a couple of words of warning. 1. Please note that I do not personally hold any trade union archives. This site is not the front door to a library or archive facility. So if you send me an email which says, “My g-g-grandfather was a plumber in Birmingham, please send me his union records”, I’m afraid I can’t help. 2. I have no idea what most of the obscure jobs of the past involved. There may well have been an Amalgamated Union of Xylophone Key Flangers. But I don’t know what its members actually did. So I can’t help with that either. The History of Work Information System might be able to help you with this – but I have no connection with that site. Oh, and one final caveat. While millions of people have been trade union members over the past couple of centuries, millions more working people were not. At the beginning of the 20th century, just one in ten working people were members. And though masses of union records have survived, much more has been discarded or destroyed down the years. So, on to the more positive bits. • The first four published volumes of the Historical Directory of Trade Unions. These are a wonderful but incomplete guide to the development of the trade union movement published between 1980 and 1994 by Gower. The first three were compiled by Arthur Marsh and Victoria Ryan, and the fourth by Marsh and Ryan with the help of John Smethurst. Wonderful though they are, the series is incomplete and there are some rather obvious omissions as a result – not Clinique least the Transport and General Workers Union. Time has also moved on since they were published, with mergers and amalgamations taking place annually. There is now a fifth and a sixth and final volume available. • The archive listings published online by Warwick University’s modern records centre. The centre has an unrivalled collection of original trade union papers, including the archives of many long since defunct trade unions deposited by their modern successors. • A variety of published sources including the potted histories that some unions include on their websites, the books that unions have produced down the years about their origins and developments, and the many general union histories published since Sydney and Beatrice Webb originated the genre with their History of Trade Unionism, first published in 1894 and revised in 1920. • Government papers and public records – some of them published (such as Labour Market Trends, from which data on this website is extracted) and some stored away in the National Archives waiting for someone with the time and interest in the subject to come along and find them. 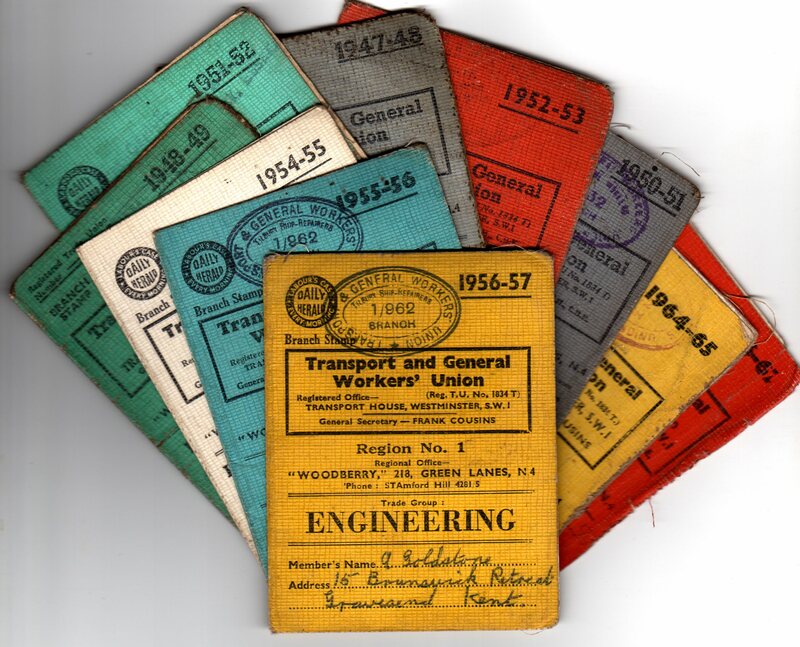 TGWU membership cards from the 1940s and 1950s. I hope this site will be useful in two ways: first, through the A to Z and trade union family trees, by helping people to identify the organisation or organisations that their ancestors joined so that they can pursue their research with more confidence; and second, by providing a glimpse of the working lives of some of the many millions of people who have passed through the trade union movement over the past two centuries. The site is not comprehensive – indeed, it could not be. There may be some errors – and I would be more than happy to have corrections suggested to me. But I hope it will prove of interest and of help to at least some people. Almost everyone must have had a trade unionist among their ancestry at some point. If not, you will probably have no need to extend your research beyond the pages of Burke’s Peerage and Debrett’s.